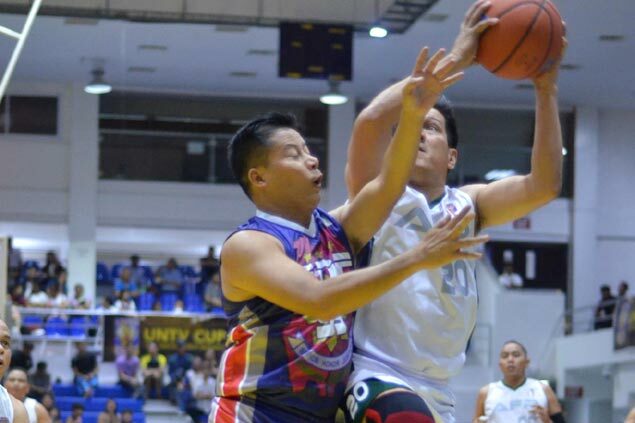 DEPARTMENT of Justice and Judiciary downed their respective rivals at the close of the elimination round and completed the semis cast in the UNTV Cup Executive Face-Off held over the weekend at the Pasig City Sports Center. Led by PCGG Commissioner Reynold Munsayac, the Justice Boosters clobbered the Bureau of Customs Transformers, 90-48, while the Judiciary Magis overpowered the Senate Sentinels, 83-68, to join early semifinalists Philippine National Police and Armed Forces of the Philippines. Meantime, the AFP Cavaliers clinched the top seeding in the semis with a 94-86 win over the PNP Responders in the event organized by UNTV president and CEO Daniel Razon for public servants. Razon said one of the beneficiaries of the league will be the Samahan Ng Mga Dating Professional na Basketbolita ng Pilipinas Foundation – PBA players who played only from 1975 to 1990. “It’s our own way of helping some PBA stars who we admired and cheered before but who can’t afford to buy their medicines these days,” said Razon referring to the players that played in the pro league from 1975 to 1990. Court Administrator Midas Marquez starred for the Magis by firing 20 points while Raul Villanueva, Wendell Ramitere and Romulo Paras combined for 40 points. Warren Tan and Sen. Sonny Angara paced the Sentinels with 18 and 16 points, respectively. Col. Jonathan Abutin struck hardest for the Cavaliers by scoring 23 points – his finest game so far. He was ably supported by Col. William Gonzales and Gen. Gener del Rosario who tallied 21 and 15 points, respectively.